Tonight, we made a slow cooker chicken with 40 cloves of garlic recipe. 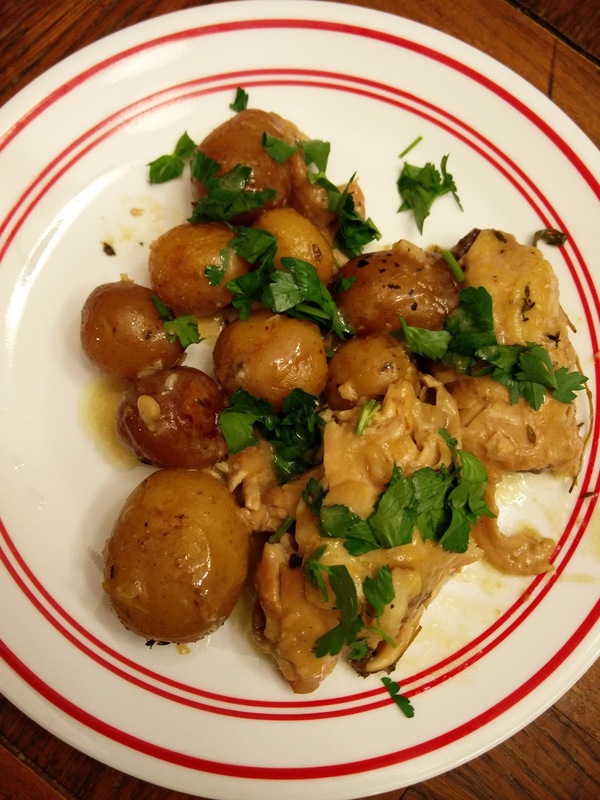 Here is the original recipe: http://www.myrecipes.com/recipe/slow-cooker-chicken-40-cloves-of-garlic. It turned out DELICIOUS. This recipe can be easily thrown together in 15 minutes in the morning. 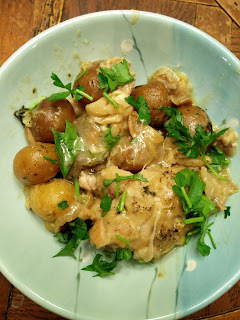 The chicken and potatoes were extremely soft and tender and deliciously garlicky (gotta keep those vampires away!). The lemon also added a lot to the dish. This dish made a lot less than we expected it to make. There is only one serving leftover for lunch. If we had anyone over, there wouldn't have been anything left over at all. The chicken thighs were also fattier than we prefer. 1. Coat bottom and sides of a 6-quart slow cooker with cooking spray. 2. Combine stock, wine, flour, butter, and 1 tablespoon lemon juice in a medium bowl, stirring with a whisk; pour mixture into slow cooker. Sprinkle chicken thighs evenly with 3/4 teaspoon salt and 1/4 teaspoon pepper. Place thighs in slow cooker, skin side down. Arrange potatoes, garlic, and thyme over chicken in slow cooker. Sprinkle 1/2 teaspoon salt and 1/4 teaspoon pepper evenly over garlic and potatoes. 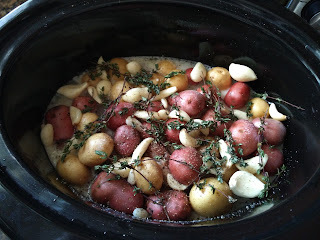 Cover slow cooker; cook on LOW for 8 hours. 3. Transfer chicken to a platter. Transfer potatoes and garlic to platter with a slotted spoon; discard thyme sprigs. Sprinkle chicken and potatoes evenly with remaining 1/2 teaspoon salt, remaining 1 tablespoon lemon juice, and parsley. Strain cooking liquid from slow cooker through a sieve into a liquid measuring cup; let stand 3 minutes. Discard any fat that rises to top of liquid. 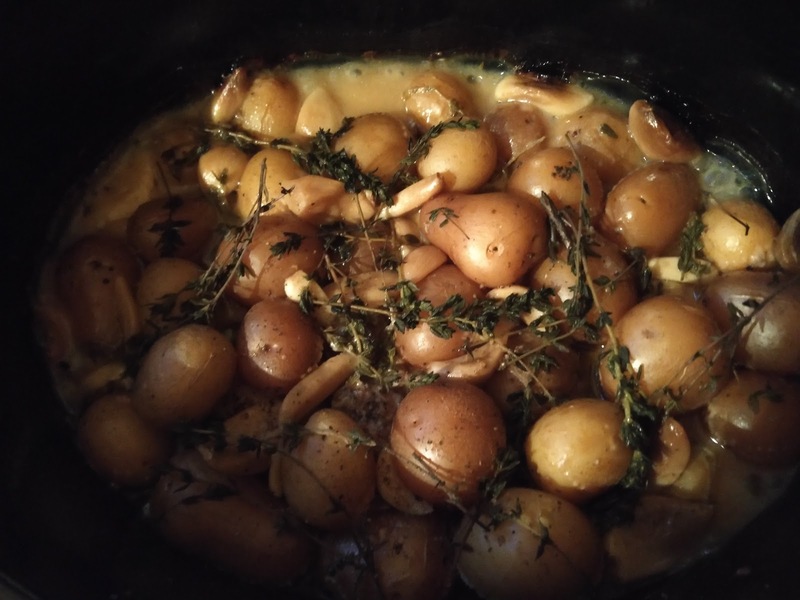 Serve jus with chicken, potatoes, and garlic cloves. It was very easy to make (only 15 minutes!) and very flavorful. The chicken and potatoes came out extremely soft and tender and the dish dish looks really pretty. 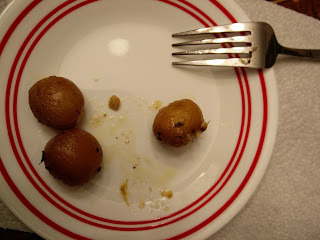 We did not like the fatty pieces of the chicken (we would like to try chicken breasts next time). Unfortunately, the parsley detracted instead of adding to the dish. The parsley was pretty but it did not complement the savory flavors well. Finally this dish made less food than expected; this might have been because chicken thighs had a lot of fat and skin on them. Use more chicken and maybe make more sauce as well.